Law calls for creation of database of faces and fingerprints of all Israeli residents. 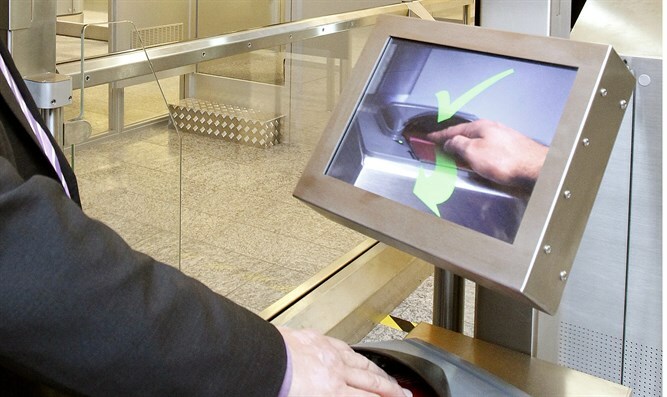 The Knesset passed the biometric database law Monday night. The bill was approved in its second and third readings after all objections were overcome. The final vote was 39-29 in favor. The bill was significantly changed from its original version. Over the course of the day it was decided that the database will not include fingerprints of anyone under the age of 16 and will not be used for unusual police applications. New additions to the law were intended to amend the arrangements for the biometric database, in which all residents of the State will have their pictures and fingerprints taken, but for those who object, their data would be tied to their smart-cards instead of being entered into a database. However, those who choose to not be entered into the database will have to renew their passports and ID cards once every five years instead of every ten. MK Nissan Slomiansky (Jewish Home), the chairman of the Constitution, Law and Justice Committee, praised the changes to the law. "At the last minute we included [the provision] that the fingerprints of minors would not be added to the database. And anyone who has doubts [about being included in the database] can request to have his fingerprints deleted." Several MKs slammed the biometric database law as an attack on personal freedom. MK Dov Khenin (Joint Arab List) said that the law put Israeli residents under "big brother." MK Yael Cohen Paran (Zionist Union) said that the Israeli public does not yet understand what the law means, but they will be angry when they do. MK Zuhair Bahloul (Zionist Union) said that the creation of a biometric database was irresponsible in light of the allegations that the Democratic National Committee was hacked during the 2016 US Presidential election and that the database would put Israelis at risk of having their personal information stolen. However, MK Yulia Malinovsky (Yisrael Beyteinu) defended the law. "There is no debate about whether smart-cards are necessary. We are in a new era and they are required. The question is about the buffer, since we fear that one day it may come out one way or another. I am convinced that the situation in Israel is good compared to other states, where [the situation is] like the wild west."